Found one file extension association related to PowerKey and 1 file format developed specifically for use with PowerKey. 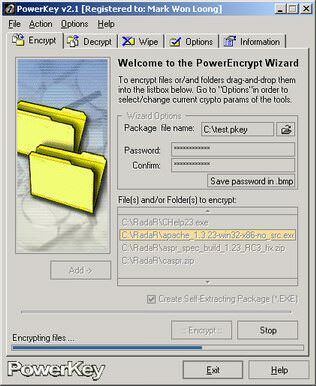 PowerKey allows creation of SFX packages (like WinZip). It also features secure deletion (Wipe) option providing you with the powerful tool designed to avoid restoration of sensitive data. It has in-built AntiPasswordSpy code which will remove the threat of your passwords being revealed providing you with a powerful shield against all key-loggers. Besides, you're provided with a password generation tool that will generate passwords proven to be strong. In case you can't or simply don't want to remember your password you can hide it in some bitmap image. However these are only the major PowerKey's features, in order to find the rest we recommend you to download and try it! Using PowerKey you're keeping your private information in safety forcing crackers to surrender. If you need more information please contact the developers of PowerKey (Elcor Software), or check out their product website.